Real Estate (Regulation and Development) Bill, 2016: Rajya Sabha today, 10th March 2016 approved the Real Estate (Regulation and Development) Bill,2016 that seeks to protect the interests of the large number of aspiring house buyers while at the same time enhancing the credibility of construction industry by promoting transparency, accountability and efficiency in execution of projects. The Bill seeks to put in place an effective regulatory mechanism for orderly growth of the sector which is the second largest employer after agriculture. Moving the Bill pending in Rajya Sabha since 2013 for further consideration and passing, Minister of Housing & Urban Poverty Alleviation Shri M. Venkaiah Naidu stated that over the years the sector has acquired a degree of notoriety which needs to be addressed to enable enhanced flow of investments, for which the Government has announced several incentives in the Budget for 2016-17 and earlier. 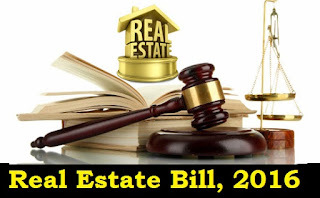 A provision is now made for imprisonment of up to 3 years for developers and up to one year in case of real estate agents and consumers for any violation of Tribunals and Regulatory Authorities.